This is what I wore to church the other day, I was feeling kind of sick of monotonous color pallets and decided that it would be fun to get gussied up and wear teals and tans offset with gold and silver. And at last I get to debut the much sought after vintage eel skin bag that I mentioned several posts back, it’s the perfect accessory that makes an outfit feel more ladylike. This skirt is one of my faves! 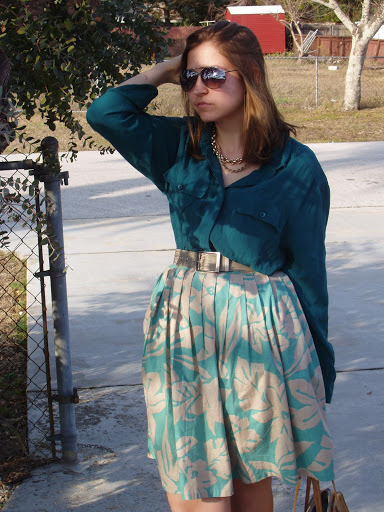 It was one of the first cool old vintage skirts that I found when I rediscovered thrifting a few years ago. It was originally mid-calf length and the pleats were twice as wide(so 70’s) so I shortened it, re-pleated and put it back together. It will always be one of those super special pieces that marks a new era in my wardrobe, when I started to rediscover my style. I hope you all are having a fabulous Tuesday!!! wearing: re-worked vintage skirt; thrifted silk blouse;vintage, metal belt,necklaces,&eel skin bag; and random sunnies from my brother. OK seriously can you come up with a more perfect outfit! I absolutely LOVE LOVE LOVE this look! i am in love with your skirt !! This is a super cool skirt. I cant wait to learn how to use my sewing machine. You can do so many things with vintage pieces & a sewing machine!! Great job!! you have such amazing knee length skirts! I love the one you are wearing here and the one in the post above! Love the sea green colours! Lovely skirt! 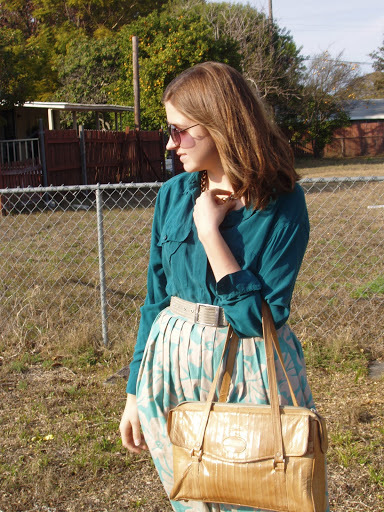 I love that skirt, it's just gorgeous and so perfect for Spring! 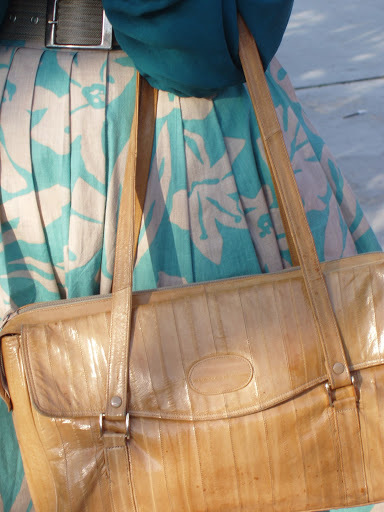 I just love the rich teal of that blouse–it suits you perfectly! Cute blouse! Love the blue shades! I adore that skirt! Your outfit is so well put together! Love the outfit.. the skirt is divine! These colors are so very pretty Laura! omg i think this is my favorite one yet! the color combination is perfect!